When we look up at the night sky we can imagine a celestial sphere and it looks as if the stars and planets all lie on this sphere. We know that there are vast distances separating the different things we see in the sky, e.g. Mercury lies about 60 million km from the Sun and Neptune about 4.5 billion km. For convenience let's do away with these distances and project all the bodies in the Solar System that we use in astrology onto the same plane. From the Earth it looks as if the planets move in a roughly circular path around us; we call this circle the longitudes. The planets also move up to a maximum and down to a minimum while moving around us, this up-down movement is along another circle that is perpendicular to the longitudes called the declinations. So there are two dimensions to consider on this sphere; the longitudes and the declinations. Geocentric or the Solar system viewed from the centre of the Earth. Heliocentric or the view from the centre of the Sun. 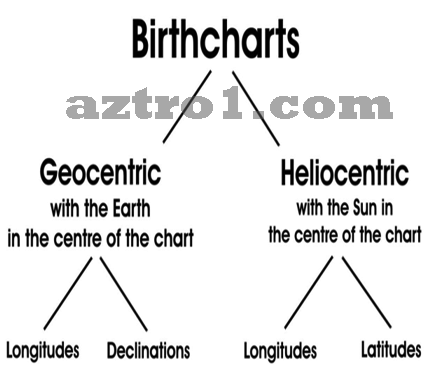 Geocentric charts are most familiar because they represent the view of the night sky. In the heliocentric perspective the up-down movements of the planets occur along a circle called the latitudes (instead of the declinations). We look at the positions on two circles that are perpendicular to each other (see Figure 1). Figure 1. 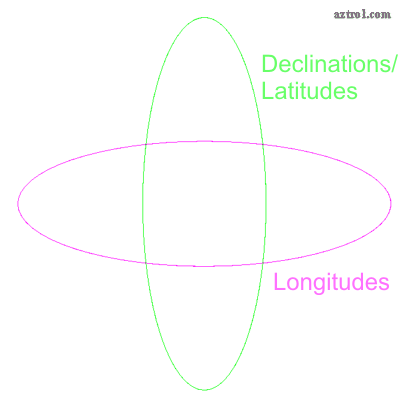 Perpendicular circles - longitudes and declinations/latitudes. The longitudes are represented by a circle in charts (Figure 2) and the planets' positions are marked in degrees. The circle is divided into 360° and decimals are used to indicate positions in between two degrees. Some astrologers prefer to use minutes instead of decimals. Figure 2. 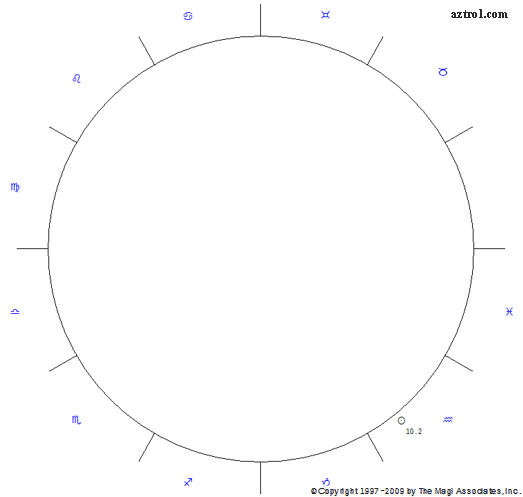 The longitudes are visualised on a circle with twelve Zodiacal divisions. The Sun's position (indicated by a symbol) is shown and can be seen on the bottom right (it is 10.2° Aquarius indicated by a symbol). 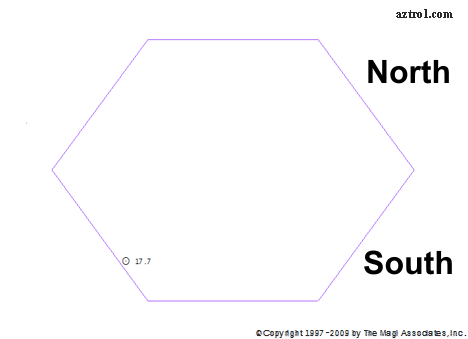 The declinations and latitudes are visualised as hexagons (Figure 3) in the Magi Society's latest software. 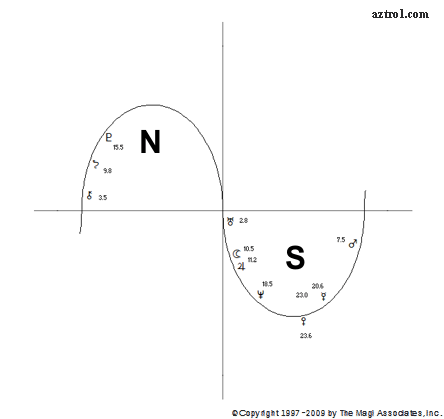 Earlier software visualised the declinations and latitudes on sine waves (Figure 4). The range in this dimension is from a maximum 90° (North) to a minimum -90° (South), with 0° in the middle. The planets have their own maxima and minima; for example the Sun moves from 23.45° North (June Solstice) to -23.45° South (December Solstice). The Equinoxes are when the Sun is at 0° in March and September. In this dimension, the planets move slowest when they are close to their maximum and minimum peaks, and fastest when they are close to 0°. Figure 3. 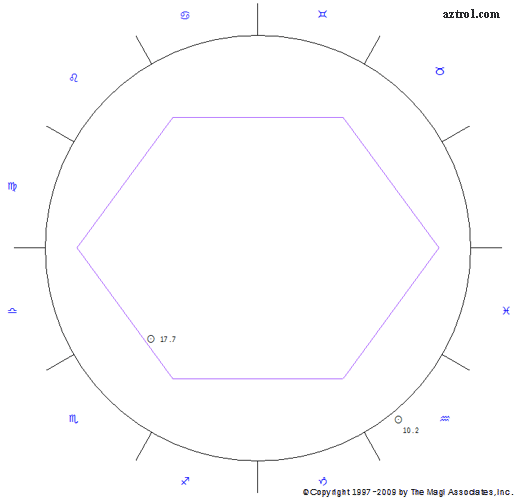 The declinations and latitudes are visualised on a hexagon. In this example the Sun's position in the declinations is shown on the lower left side at is 17.7°. It is below the middle of the hexagon and is therefore South (this is written as 17.7° S or -17.7°). If it were North then we would write it as 17.7° N or just 17.7°. Figure 4. The sine wave form of representing the declinations with the planets arranged along the curve. The latitudes are represented the same way. The two charts, longitudes and declinations/latitudes, are usually shown together; see Figure 5 for an example. Figure 5. Representing the longitudes and declinations in a geocentric chart. The Sun's position is shown again in this example. Heliocentric charts are represented in the same way. In Magi Astrology we use four charts (traditional astrology only uses one chart). Figure 6 shows how we get four charts. Firstly we have two perspectives; geocentric or the Solar system viewed from the Earth, and the heliocentric or the view from the Sun. Within these two perspectives are two dimensions; longitudes is the view from the top and declination/latitudes are the views from the side. So for any birthdate we view the Solar System in two dimensions and from two perspectives. This gives us four charts and a lot more information to work with than traditional astrology that only uses the geocentric longitudes. Figure 6. The four charts used in Magi Astrology - see text for explanation.